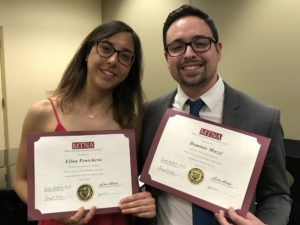 Dominic Muzzi, who studies with Robert Plano at Indiana University, won first place in the MTNA Young Artist Piano competition. Dominic performed in the winners recital on Tuesday afternoon and was awarded a $5,00 cash prize sponsored by Steinway. Elina Rubio Pentcheva, student of Indiana teacher Mauricio Fuks was awarded 2nd place in the Young Artist strings competition. Ms. Pentcheva attends Indiana University School of Music. She was awarded a $1,500 cash prize made possible by the MTNA Foundation Fund. Congratulations to both students for their hard work and dedication to their art! Here are the Indiana Winners that passed through ECD and are headed to the National Finals this weekend!! Please wish them luck in Spokane, and stop by to hear their performances if you can. Stay on the lookout for the results of the Young Artist Composition Competition. Our representative, Katherine Bodor (student of Don Freund), had no competition at the division level, so she went directly to the national finals. Her piece will be performed if she wins. 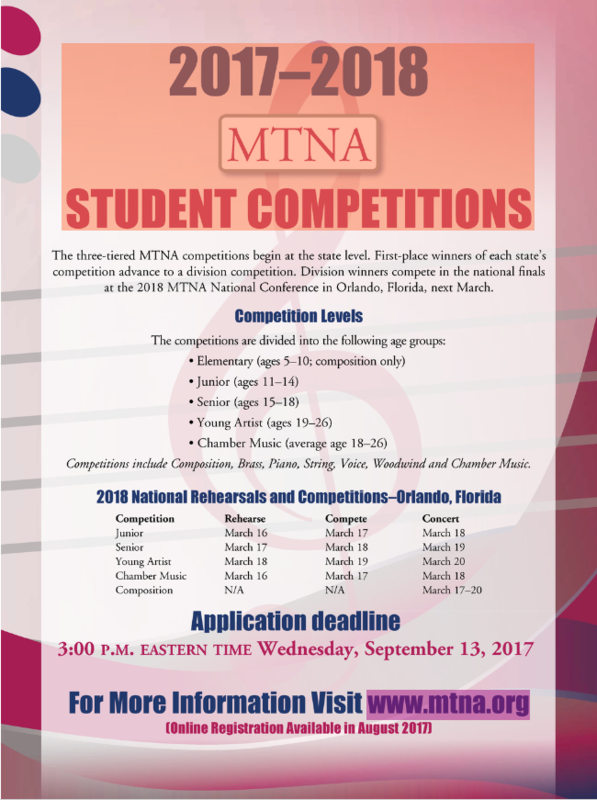 Music Teachers National Association is pleased to announce the results of the composition competition for the East Central Division. The winning compositions automatically advance to the national competition as national finalists. The results of that competition will be announced by the end of January. Congratulations to all of the participants in the competition! We hope that the comments you receive from the judges will be helpful to you and your teacher. Your efforts are to be commended, and we hope that you will continue to learn and grow as a composer. Good luck with your musical studies! 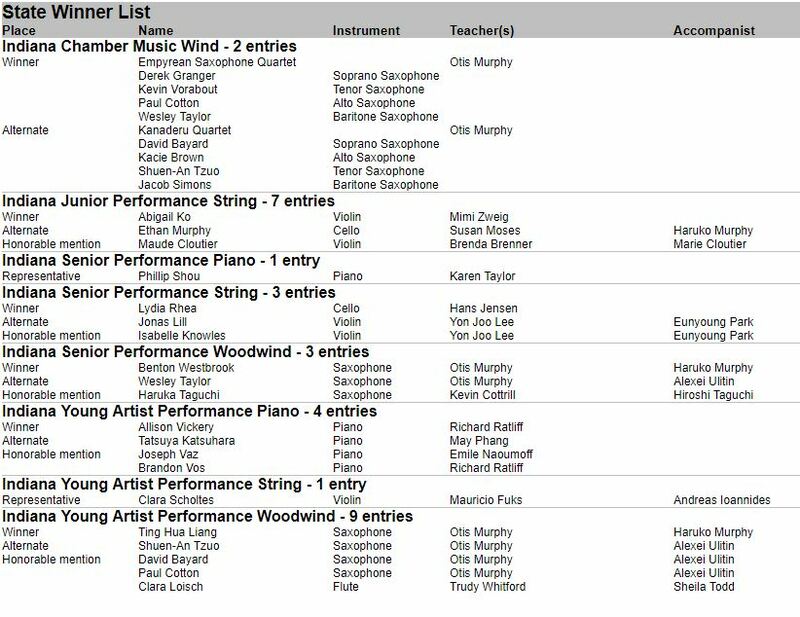 Music Teachers National Association is pleased to announce the results of the Performance Competition for the East Central Division (ECD). Included in those results, Indiana is proud to announce we have two winners, two alternates, and two honorable mentions from our state. The winners now advance to the national competition which will be held at the MTNA National Conference in Orlando, Florida in March 2018. Alternates will be the representatives should the winners in their category be unable to compete. Good luck to both Abigail Ko and Clara Scholtes as they compete in March! The 2017 MTNA Performance Competitions were held this past Saturday at Ball State University. Indiana is happy to announce the winners of the competition. Congratulations to both students, teachers, and parents for all the hard work and dedication you’ve given to your art! Winners will compete in the East Central Division (ECD) Competition on Saturday, January 6, 2018, at the University of Illinois Urbana-Champaign. The ECD Division is comprised of the states of Indiana, Ohio, Michigan, Illinois, and Wisconsin. 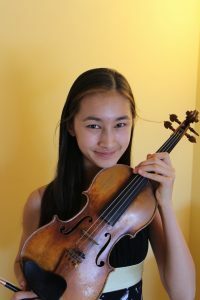 IMTA congratulates Maya Kilburn, WINNER of the East Central Division MTNA Performance Competition in Junior Strings! Maya will now advance to the MTNA National Performance Competition, to be held at the National Conference in Baltimore, MD. The competition will be held on Saturday, March 18, 2017. Please join us in celebrating this fine young musician! Indiana is proud to announce we have several winners, alternates and honorable mentions that were named in the East Central Division Competition!